It’s just not my philosophy to create exact copies. Things must evolve. I often ask myself, “What would Anthony be doing if he was still with us now?”. The Slazenger sweater is a good case in point. The objective was to design a product that is instantly recognisable and clearly related to the original, yet very modern, wearable and totally up to date. This is certainly a more wearable jumper today than an exact replica of Connery’s would be. It’s not a baggy jumper like Connery’s is. Even though the fit has been updated to be shorter and cleaner, it still has a classic fit. If you’re undecided on whether to get a certain size, I recommend sizing down if you like your jumpers to fit closely. For instance, my chest measures 38 inches, so I should wear a medium per the sizing guide (38-40). However, I found that a small (35-37) has a cleaner fit on me and is not too tight. The medium would better fit a size 40, which is at the top end of the recommended medium size range. 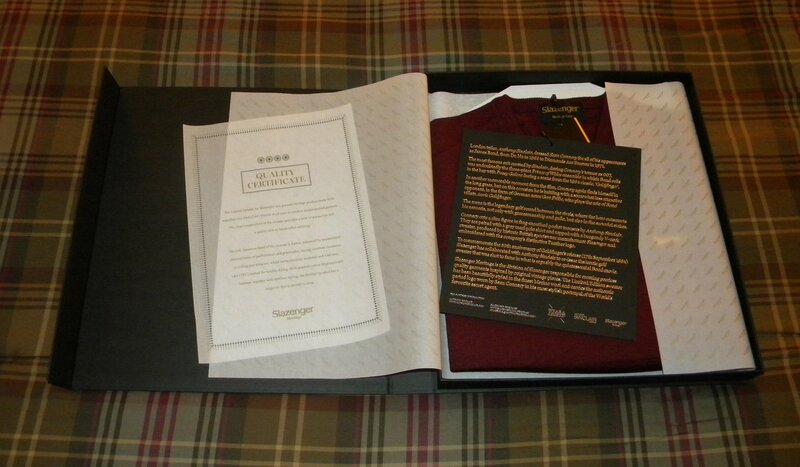 The jumper comes packaged beautifully in a heavy black cardboard box with a magnetic closure containing a “quality certificate” and a very large descriptive tag about the history of the jumper in Goldfinger and Slazenger Heritage. Anthony Sinclair has also just recently released a white twill double cuff shirt, and the cuffs have rounded corners like on Sean Connery’s shirts in Goldfinger. The shirt comes with either a semi-cutaway or a cutaway collar in either a regular or slim fit. The Anthony Sinclair shirt is “evolved” in its style from the original shirts in Goldfinger that may have been made by Frank Foster. Anthony Sinclair also just released a number of new blue grenadine tie colours, for a total of seven different blue grenadine ties ranging from ice to midnight. 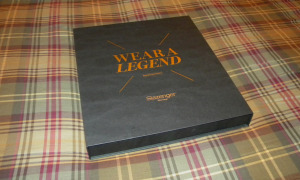 Visit AnthonySinclair.com for more information on the Slazenger jumper and the other new offerings. “The Anthony Sinclair shirt is “evolved” in its style from the original shirts in Goldfinger that may have been made by Frank Foster.” Interesting, Matt. Foster claimed to me that he made the shirts for “Dr. No” although this is obviously not the case. (Interestingly he never mentioned the shirts he made for “Never Say Never Again” even though this is not as far back in time as the 1960’s.) 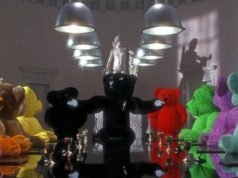 Intrigued, I took a look over all your previous posts for “Goldfinger” and I believe you are right. It was Foster who produced the shirts, or at least many of them. Foster’s unique placket style is clearly visible here; https://www.bondsuits.com/dark-brown-striped-suit/. 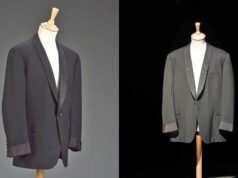 Being for Bond (and as Bond wore this signature cuff in his first two preceding movies) it’s a little strange that Foster didn’t produce the shirts with a cocktail cuff, opting instead for a standard double cuff. However, the other factor, aside from placket style, which indicates to me that Foster was the shirt maker is the rather interesting choice of materials used. For the shirts worn with evening wear in the previous two movies they were a standard plain cotton. Here we have an interesting self stripe. 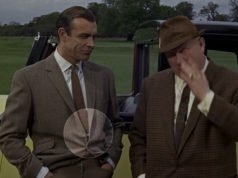 Plus, looking very closely at the cuffs of the cream shirt worn with the hacking jacket; https://www.bondsuits.com/the-hacking-jacket/ , it shows a very subtle dobby design in the material. Foster still carries a more interesting array of patterns, in addition to standard plains and stripes and checks, than you might get from many shirt makers. While of course Turnbull and Asser could have produced shirts with a more “interesting” pattern for Connery’s Bond movies, the fact is they didn’t. It’s interesting that, having used T&A for 2 movies they switched to Foster (why?) before switching back to T&A for “Thunderball” and then back to Foster for “OHMSS”, back to T&A for Connery and finally, Foster, of course, for all of Moore’s run. Do you think the “updated” version would be suitable to wear while playing golf? Although I’m not a golfer, I can imagine that a looser fit, chunkier knit, and synthetic fabric might be more appropriate for sports. You’re probably right that a fuller fit is better for golf. However, I don’t think a synthetic wouldn’t make a difference for golf like it would for more active sports. This is interesting. Of all the items covered in this blog, of all the labels Bond has worn, this has to be the most mainstream and affordable item yet. Certainly in the UK, in chain stores like Sports Direct, Slazenger t-shirts and track suits are extremely cheap (2 for £5.99) and – I’m trying not to be a snob here – the reputation of that shop’s customers is less than classy. (Sorry…but hey, I’ve shopped there and I’m definitely not classy!). There is a slightly Chavvy look to wearing cheap sportswear in the UK, it’s not a refined image, so it’s interesting to see that either Slazenger’s image has become less exclusive since Goldfinger, despite several name checks in the dialogue, or Bond is starting to shop in the high street for his golfing wear. I’m sure Slazenger’s product and reputation are still as high as ever, I own several t-shirts, but I’d be stunned if Daniel Craig wore them onscreen as Bond. This re-issue is not a cheap item like most Slazenger clothes. The quality of this jumper is probably much higher than the one Connery wore. You do not need to buy expensive garments to look “classy”. Just because Slazenger is cheap compared to some ludicrously priced designer garments, worn correctly by the right person they look just as good, if not better. Where are these jumpers made? In the UK?